How do class relations contribute to processes of capitalist development? Can workers’ struggles generate more progressive forms of human development, in the form of improved working and non-working conditions, rising pay and active social movements that bring workers’ concerns to the fore? Within much thinking about development the principal debate over the past 30 years or so has been between advocates of state-led and market-led development. For these advocates either state allocation and generation of resources or market-efficiency generates a growing pot of social wealth which trickles down, at some indeterminate point in the future, to the labouring population. Advocates of these approaches often support labour-repressive measures (ranging from opposition to minimum wages and worker welfare to support for dictatorial regimes that outlaw trade unions, raise the rate of exploitation and repress labour) as a means to kickstart the ‘development’ process of capital accumulation. From these perspectives capital and the state come first and receive political priority, and labour comes a distinct second, if at all. 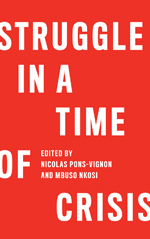 Within development studies, such perspectives have become so normalised that there is rarely any comment on how they rest on a fundamental contradiction: Whilst development practitioners aim to improve the lot of the poor, such labour-repressing measures actually worsen their conditions for a considerable period of time and offer no guarantee when (or if) they will improve. In part such perspectives are supported by the assumption that labour represents just another interest group in society that, if enabled to impose demands on either states or private capital, will divert resources from the more important objectives of capital accumulation and the accumulation of productive power by the state. But what if it is the other way round? What if actions by workers contribute directly and positively to the development process? If this is the case then development studies would have to rethink its state and capital-centrism, and begin to consider ways in which workers can shape progressively the development process. My research into capital-labour relations in north east Brazil suggests that organised labour in poor regions of the world constitutes a significant force in generating progressive developmental processes and outcomes. The São Fransciso valley in the interior of the Brazilian north east is home to a fast-expanding zone of export horticulture. Thousands of hectares of irrigated land enable the production of high quality grapes and mangoes for Northern markets. The valley is but one of many cases of export horticulture production that have emerged across the global South over the past three decades and that operate within tightly-coordinated retailer-dominated global value chains. There are numerous cases, for example in South Africa and Chile, where export horticulture is characterised by domineering farms and precarious conditions for labour – temporary contracts, low pay, limited union recognition or presence. Such conditions are mirrored elsewhere in the global economy, in China’s industrial zones in particular and in other regions of low-wage export manufacturing. These conditions are so widespread that it is common to hear the ‘race-to-the-bottom’ thesis (which argues that any regulation of capital by states or labour will push it elsewhere, thus forcing states into ‘light-touch’ or zero regulation of firms) repeated by friends and foes of labour alike. In the São Fransciso valley, however, the local rural workers’ union, the Sindicato dos Trabalhadores Rurais (STR), has been able to mobilise the workforce in the export grape sector with impressive results. As part of their competitive strategy Northern retailers have, since the 1990s, been ramping up supplier requirements as part of what is often referred to as the global retail revolution. Suppliers to Northern supermarkets need to produce grapes according to strict size, shape, colour, weight, sugar-level requirements, and must do so under increasingly regulated production process codes, for example covering the methods and timing of herbicide application. Meeting such standards requires farms to operate according to increasingly complicated production methods. For example, in the São Fransciso valley, export grape producers require over 30 operations per harvest cycle to meet retailer standards, while producers selling onto ‘traditional’ (street) markets within Brazil perform as few as 9 operations per harvest cycle. Operations include detailed pruning of bunches and berries, applications of herbicides at specified times, leaf and berry analysis, and the regulation of shoot and branch growth. Exporting farms need to perform these operations efficiently and on time otherwise they risk steep declines in fruit quality. For example, berries that are not pruned may begin to rub against each other, creating blemishes, becoming less attractive to customers and thus losing value. In order to carry out these operations exporting farms rely on an increasingly skilled and hard-working labour force. A large percentage of the valley’s workforce is female. Initially, working conditions in the valley’s export grape sector were very poor, characterised by low, and often ad-hoc pay, lack of employment security, and even the use of child labour. However, in the mid-1990s, the STR began an ongoing campaign which has led to very significant improvements in workers’ pay and conditions. At the heart of STR’s strategy has been the threat, or actual use of strike action. As mentioned above, in order to meet retailer demands exporting farms must implement a strict and precise production calendar. Any delays reduce fruit quality. This implies a strong reliance on dedicated and skilled labour input. It also represents, for workers, a vital source of structural power, that is, the ability to disrupt production through suspensions of work. Short strikes by workers on exporting farms can have disastrous consequences for fruit quality and hence its sale price. This structural power, which has been augmented by rising retailer demands, has been realised through workers’ associational power – their ability to organise through the STR. Early gains made by the STR included commitments by farms to employ only registered workers, leading to pension and other social security contributions, such as the rights for women workers to take paid maternity leave, specified working hours, payment above the minimum wage, higher pay for overtime, the provision of protective clothing to workers, and the right for the STR to organise and visit workers on farms during the working day. Subsequent gains have included the provision of crèche care, safe transport to and from work, and the rights of workers to pursue an education outside work, implying the need for workers to be able to leave the farms on time. Farms have not taken these victories by the STR lying down. On the one hand they have tried to reduce non-wage costs (such as their commitments to crèche care and maternity leave for women) by restructuring the rural labour force and reducing their reliance on women workers. On the other hand they have tried to reduce workers’ associational power (the influence of the STR) by providing benefits to workers directly, such as free or very cheap on-farm housing and some health care, as an attempt to substitute themselves for the STR as workers’ principal benefactor. Such counter moves by employers are to be expected and reflect an ongoing struggle by employers and workers to shift the balance of class forces in their favour respectively. Are there any broader conclusions that can be drawn from this case study? Within development studies it is often considered that progressive ‘policy’ must come from above – either from states or from ‘socially responsible’ employers. Whilst such policies can, under certain circumstances, contribute to meaningful improvements in the livelihoods of workers in the global south, it is much rarer to hear development thinkers and practitioners proclaim the need for workers’ collective action as a means of achieving more equitable and meaningful human development. But in the case of workers in the São Fransciso valley, meaningful improvements in their livelihoods have been achieved through purposive collective action, spearheaded by a progressive rural trade union. This example suggests that capital-labour relations and in particular the struggles by workers for better pay and conditions constitute a central driver of the development process. In countries such as South Africa and Chile employers across much of the export agriculture sector have been able to impose a domineering labour regime upon workers, with miserable consequences for the latters’ human development. In north east Brazil, workers have been able to transform their structural power into associational power and in doing so have achieved significant improvements in their livelihoods. These dynamics, where capital strives to minimise its costs through lowering labour costs, but where labour attempts to respond collectively, are being played out across the global south, from the Chinese industrial centres to the maquila zones of Mexico and beyond. The realisation of workers’ structural power through organised associational power is the struggle for human development. Ben Selwyn is a Senior Lecturer in International Relations and Development Studies at the University of Sussex in Brighton. He writes about labour and development, and is currently working on a book provisionally entitled ‘Capitalism vs Development: Critiques and Alternatives’. Selwyn, B. (2012) Workers, State and Development in Brazil: Powers of Labour, Chains of Value. Manchester, Manchester University Press.